Song is loud, bubbling “bob-o-link,” often given in flight; also other “twanging” phrases. Description: Sharply pointed tail feathers. 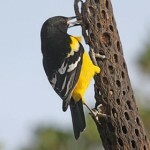 Breeding male is entirely black below; black head, wings, and tail; buffy hindneck; white scapulars and rump. Female is buffy overall with dark streaking on back, rump, and sides; dark striping on head. Juvenile similar to female but lacks striping below. 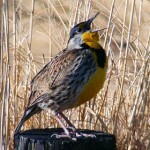 Habitat: Usually found in ungrazed to lightly grazed medium to tall-grass prairies, wet meadows, and retired croplands. Sometimes found in small grain fields. Where in Nebraska: Common spring and fall migrant and summer resident across the state, being most common in central Nebraska and less common in eastern and western areas. Field Notes: Winters in South America. 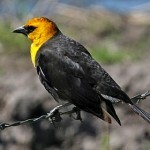 Often seen during fall migration with other blackbirds in agricultural areas. 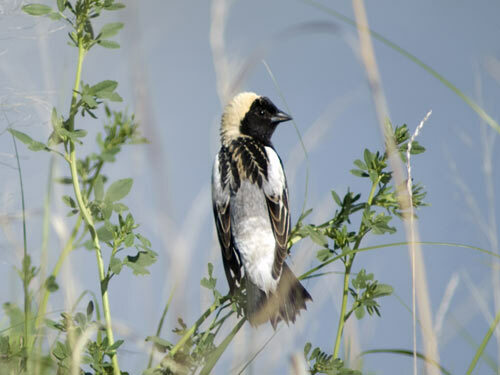 Fun Facts: The Bobolink’s round trip migration is about 12,500 miles long!